Review: "Bedemon: Symphony of Shadows" - Sea of Tranquility - The Web Destination for Progressive Music! 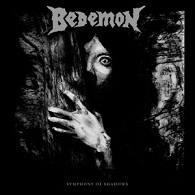 Despite a major roadblock in the tragic death of founding member Randy Palmer, Bedmon, a group with ties to the doom metal progenitors Pentagram, have stuck through difficult times to release Symphony of Shadows, their sophomore album. The band has been playing doom metal since the seventies, though the amount of legitimate recordings they've put out has been quite sparse. For that reason, Symphony of Shadows plays like the culmination of all that Bedemon was designed to be. 2012 has shaped up to be quite a year for doom metal, with stellar contributions from Evoken, Ahab, and Aldebaran still lingering fresh in memory. For those not inclined to long, drawn-out songs with lugubrious, drawn out tri-tone chords and gutteral growls at the forefront, the music of Bedemon is likely to hit the spot. Symphony of Shadows is all about The Riff, and as far as old-school metal releases go, this will hit the spot for those not inclined to ride the new waves of black and doom metal. But while this is a satisfyingly heavy labor of love, it also does sound a bit dated, and at times one-dimensional. It certainly isn't a simplistic genre exercise, but it's unlikely to have a cross-genre appeal. Still, for fans of Pentragram or for those who like their metal in the style of the seventies, Symphony of Shadows is a good way to spend an hour.